A sulphur based, foliar applied, zinc and manganese product, which is highly effective for the prevention or correction of deficiency in a wide range of crops. 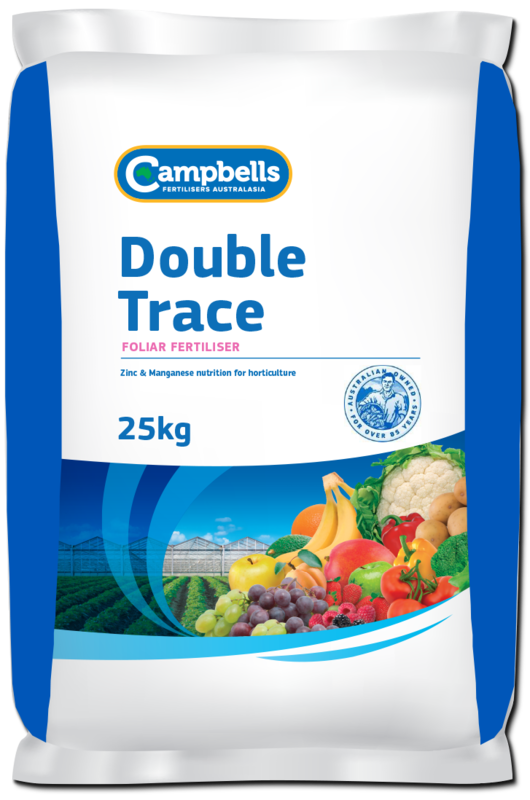 Campbells Double Trace is a fully soluble combination of two key trace elements, zinc and manganese. Foliar applied Double Trace can be used where soil applications are ineffective due to high pH, where deficiency has been identified from plant or visual analysis or during peak demand periods, where additional zinc and manganese nutrition is required. Campbells Double Trace is suitable for spraying via foliar application. It dissolves rapidly and completely and remains in solution ready for absorbtion via leaf surfaces. General rates for citrus, grapevines, potatoes, onions and other horticultural crops are 2 kg/ 1000L water. The actual rates, number of applications and their timing will vary considerably for different crops and for different districts. Before application, seek advice from your Campbell’s Double Trace distributor or your local agronomist.